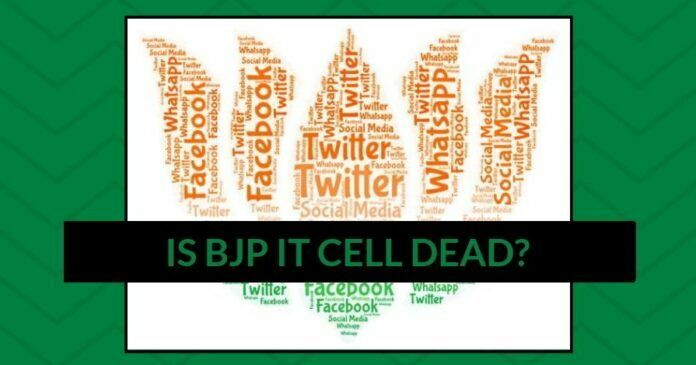 Home Politics Is BJP IT cell dead? Or is it being revamped? Will BJP IT cell wake up and take the challenge? BJP defensive will only yield so much, it needs to go on the offensive and ramp up all possible mechanisms, particularly IT and thinking out of box schemes. Going by how poorly BJP IT Cell performed in recent state elections, one would wonder if there is such a thing as BJP IT Cell. 400 million Indians carry smart-phones (not mobile phones) today and it has a penetration much beyond urban areas into rural areas. You hear about all the good work done by BJP in the three states they lost in Hindi belt, but I have not seen a single message or video on social media. We hear from some TV interviews, the work done on electricity, cooking gas and many other factors, and you would think there would be simple videos, messages on giving the statistics, comparing how things were before to today, or even real interviews of people who benefited for each state voters whether it is Jan Dhan, cooking gas or even timely pension. In this era of instant information and slick videos, when negative messages are bombarded day and night both on Social media and TV media, this is a suicidal strategy to ignore IT. Also, how about exposing Congress on whether it is corruption, terrorism or even conversions? Not a single terror incident occurred during the Modi regime affecting common man and during Sonia rule, the number of terror incidents and victims is next only to war-torn Iraq and India was not even at war! How Congress watered down vigilance and laws so as not to affect Muslim sentiments and exposed mostly Hindus to terrorism deaths and havoc. How about interviewing the real terror victims, many of whom were maimed and how their families suffer when a breadwinner gets hurt. I get my tax refund almost immediately now, whereas, before Modi, it used to take months. Enormous infrastructure work is being done, not just roadways, but also railways and waterways. Why not ask the common man, a Metro Commuter in Delhi as to how his commute time has reduced thanks to the Metro! If a focused effort to show how things were before and how they are today is made, there will be night and day difference. How about what Manmohan Singh said, ‘Muslims have the first right to country’s resources’ to what Modi says – ‘Sabke Saath, Sabka Vikas’? The contrast is extremely powerful; get the real statements and show how Congress’s way is of dividing and Modi’s is a way of uniting. Nah, nothing like that happened and there is somehow a feeling that speeches alone will suffice. In this era of instant information and slick videos, when negative messages are bombarded day and night both on Social media and TV media, this is a suicidal strategy to ignore IT. For those of us who want BJP and Modi to win, we do not understand the mindset. Seems like, the attitude is let us get Modi Ji to come, give a bhaashan and we will sit back and relax. There also seems to be an impression, giving messages on Twitter will suffice, which is completely wrong. For heaven sake, at least learn from the enemy. During Presidential elections when Reagan stood, he asked a simple question, “Are you better off today than 4 and a half years ago?” People understood and the rest, as they say, is history. Most importantly, an offense is the best defense, but where is the offense? Why is Rafael being pushed so strongly? What is BJP’s strategy on the lies being peddled again and again on Rafael? Apparently, BJP gave 70 press conferences, but the power of repetition of lies by Congress, again and again, make even a lie to become the truth or at least sow doubts in the mind. Where is the offensive on Congress deeds and scams? I heard Modi Ji talk about Quattrocchi mama but most young people do not even know who Quattrocchi is. How about phone banking, coal scam, 2G scam, and all the scams? How about dramatizing in a Pixar or cartoon type video on how phone banking comes about, a rich crony capitalist calls up the finance minister and finance minister calls up the bank CEO and bank CEO provides the loan with a small cut and big chunk goes to Congress coffers. Modi Ji said 52 lakh crores were given away like this, is there a way to help the public understand what 52 lakh crores can do – it can pay personal income taxes for 13 years; it can wipe out farmers debt or maybe even connecting all the rivers. Karti Chidambaram I understand boasted on Twitter that he is worth 100 billion dollars (not rupees), put it on and ask people. Of course, the problem will be for BJP why is Chidambaram still roaming free? Most importantly, an offense is the best defense, but where is the offense? Why is Rafael being pushed so strongly? The idea is to wipe out clean and scam free image of Modi and sow strong seeds of doubt to take away BJP’s advantage of scam free Government over Congress? ‘Death by a hundred cuts‘ is a real workable strategy and BJP defensive will only yield so much, it needs to go on the offensive and ramp up all possible mechanisms, particularly IT and thinking out of box schemes like Chai pe Charcha or accomplishments melas with simple messages on developments in all languages. Satya Dosapati is an activist based in the US working on causes for both in India and US. He played a critical role in the introduction of paper trail for India's Electronic Voting Machines called VVPAT. He and another activist organized All American Rally for Trump bringing in various ethnic communities together in support of Trump Presidential Election. He is well known for challenging 100 and 30 million dollar lawsuits from Sonia Gandhi proxies in the US when he coordinated a UN protest against Sonia Gandhi representing Mahatma Gandhi values at UN and taking a full page Ad in New York Times exposing her. He has several successes in an activist movement from forcing Andhra Pradesh CM YSR in 2007 in banning conversions insideHindu temples, bringing attention to the plight of backward caste minor girls in West Bengal being kidnapped and thrown into sexual slavery through love jihad. His presentation on Plunder of India by Sonia UPA received nearly 2 lacs hits. He was also engaged in animal rights movements in the US for health, environment, and compassion. He received his bachelors from IIT Chennai and pursuing a career in Telecom in the US. HINDU IS A SELFISH RACE . THEY HAVE NO LOVE FOR NATION . ALL OUT TO LOOT AND RUN AWAY . THEY ARE NOT READY TO LOOK IN THE FUTURE . WE HAVE MILLIONS OF CONVERTS ALL OUT TO DESTROY THE NATION ITS CULTURE . INDIA GOVT CAN NOT RUN SMOOTH UNLESS THEY HAVE PLAN TO UNDERSTAND THESE CONVERTS ARE NOT NATIONALIST BUT ANTI NATIONALS. WE NEED GOVT FUNDING TO RECONVERT THESE POOR AND FOOLISH PEOPLE . HINDU THE SELFISH RACE . LOOK AT ALLL LOCAL CONVERTS AS MUSLIM, CHRISTIANS, LEFTIST , MIO. ALL ONCE HINDU CONVERTED TO GET JOBS OR GET AHEAD . ALL HAVE FORGOTTEN THEY ARE INDIAN FIRST . BUT FOR BETTER INDIA THEY NEED HONEST LEADERS . CONGRESS WITH VOTE BANK OILICY , APPEASING POLICIES , DYNASTY RULES HAVE CORRUPTED ALL DEPARTMENTS AND OFFICES. LOCALS SHOULD RISE ABOVE THESE SELFISH IDEOLOGY AND FIRST GET RID OF ALL LEADERS WHO DIVIDE AND HAVE OR HAD NO PLANS TO BUILT THE NATON NOR THE LIVES OF PEOPLE . THEY ARE FEW ON TOP . HESE LOCAL CONVERTS CAN BE EASILY DEFINED AS ANTI NATIONAL AND BARRED FROM VOTING . OUR ENEMIES OF NATION USE THEM FOR EVERYTHING . THAT NATION HAVE FEW MORE YEARS FOR ITS DEATH OR TERMED AS SICK NATION FOR MANY YEARS TO COME . RULES NEEDED TO CURB THESE CONVERTS. NATION SHOULD INVEST, OPEN DEPT TO RECONVERT THEM TO HAVE THEM GOOD LIFE . Satya should have guessed the right answer. Most any social media platform is controlled by US entities. Twitter happily promotes rabidly anti Indian material. They can neutralise BJP or any other IT cell in a few hours. They would have done that effectively in last two months. This is the question everyone is asking on twitter and other platforms. Only BJP supporters are working hard. BJP IT Cell, not sure where it is. Haven’t heard of it, off late. Not sure what their masters have told them, otherwise why would they not work? Strange, but that is the reality. Rahul Easwar playing both sides?